Side 1 printed with 1 foil stamped area printed on uncoated 100lb Deep Pine Linen stock. 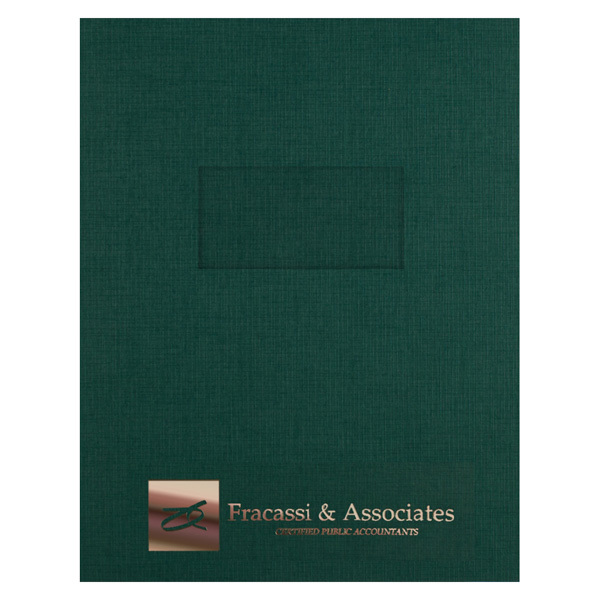 Fracassi & Associates' report cover matches the color of money, fitting for certified public accountants. Only the firm's name and logo are on the bottom of the cover in a Metallic Pewter foil stamp, which adds a smooth texture to the Deep Pine Linen stock. A serif font indicates the firm is reliable and respected. The logo is a monogram design inside a box, representing the firm's stability. The 4" x 2" window increases your order's longevity and versatility when you insert a customizable title page for each client or project. Two spine tabs let you staple 8 1/2" x 11" reports, tax returns, and other documents directly into the interior. This guarantees each page stays in order and that nothing is ever lost in the shuffle. Customize the panels with colorful photos and illustrations, a foil stamped logo, or other branded elements to make your design stand out. Dimension Open: 17 1/2" x 11 1/4"